Information from our IT people who have solved like issue at many sites with various drive drop issues. Below is some useful information that relates back to correcting Network Drive dropouts under Windows 8 and 10. It has assisted clients previously. There are two options. The first check box option has assisted users with this general Windows dropout issue. 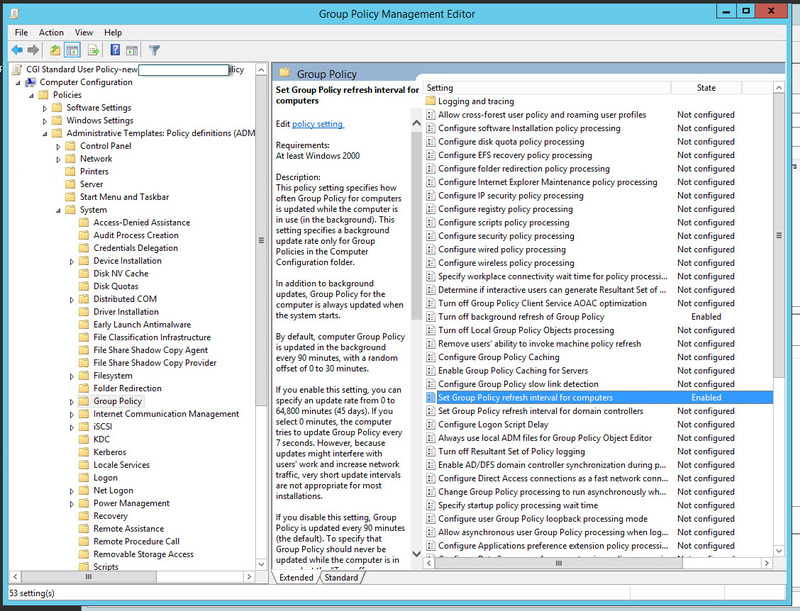 Q: Why is the Group Policy preference that sets drive mapping not working on Windows 8/10 and Windows Server 2012 machines? A: Network drives aren't correctly mapping in Windows 10 & 8 and Windows Server 2012, though the Group Policy setting that mapped them worked on Windows 7 and Windows Server 2008 R2. The solution is to modify the Group Policy preference drive map so that the reconnect option isn't selected (see screen shot below). 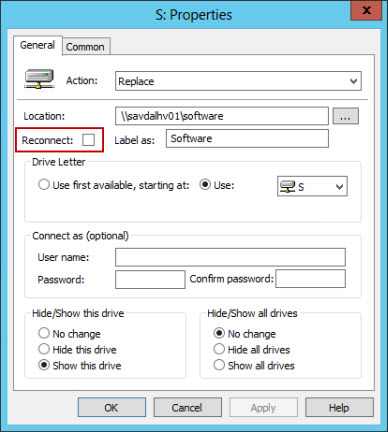 This enables the drive maps to work on Windows 8 and Windows Server 2012. It appears that this issue is the same for Windows 10 and Server 2011/12. Many KB articles exist with various Servers and Windows 10 and the mapped Network Drive issues. The 2 key areas, out of many different settings required for investigation, have been AV and the PROPERTIES of the GP Drive Mapping. The /persistent:yes flag tells Windows to keep a persistent connection to the share, regardless. Since I have done that, the drives stay mapped always. I was not able to get this working via a GPO.. and I know it's preferred by most, but this was my solution. We SOLVED this issue. None of the other solutions worked, but scheduling a background refresh rate for group policy did. We set it to refresh every 18 hours, effectively solving the issue. We just ask the users to log off ever night, which resets the timer. Strangely, turning off the background refresh entirely did not work - it was like the setting was not applying. I set the refresh interval on EVERY group policy object. I have had this exact issue, I verified it was group policy by doing a gpupdate /force on one PC whilst having a network drive open on my screen. Sure enough the gpupdate closed the window and momentarily disconnected the network drive. I have changed my GPO to update now so will see how it goes. This was causing a major headache for one user as their application ran from a mapped drive. Hey just thought I'd let you know this worked for me. For some bizarre reason, using the Replace option for mapped network drives in your GPO doesn't work properly on Windows 10 clients. You must use Update only or face periodic disconnected drives when the GP updates in the background. are not supported by GeeDee. TCP/IP v6). **For Domain Controllers or Exchange Servers we recommend TCP/IP v6 is left as default. § Ensure the computer is only connected to one physical network. § Check the type of network card installed on the computer, confirm the correct drivers are installed. § Under connection properties, disable all power management options to remove control from other programs. § If running DHCP check how often new TCP/IP addresses are allocated or better yet set to static for easy control. § Optimise for High Performance. § Disable items such as hibernation, turning off HDD and Network cards etc. CA was designed for the Scale-out File Server workload, and it provides both disk write-through guarantees and “transparent failover”, where a client re-attaches to file handles after a cluster failover, thanks to a resume key filter running on the server. This means that applications like Hyper-V and SQL Server continue to dish out their virtual machines and databases when a storage cluster node reboots. You can enable CA on non-SOFS shares in a cluster, and you can use end-user applications like Word with them, but for a variety of reasons, it’s not something we recommend. On a standalone file server, you cannot configure it at all. Windows Server 2012 set the precedent of enabling CA by default on all clustered shares; something I now regret but cannot change... Review above link for additional information. Please disable if experiencing issues. This issue occurred only for one single user at a location where more than 15 users existed. Removing this offline option immediately corrected this users issues and their Unknown Internal Operating System Errors.